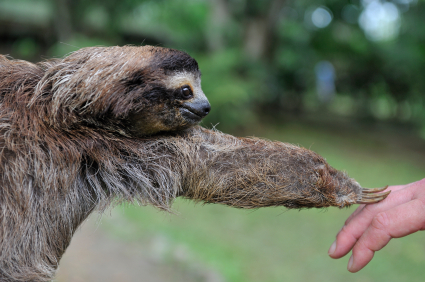 Our 'Five-Toe' is even Cuter than this Sloth! himself ‘The Five-Toed Sloth”. He retired from doctoring due to back/hip pain and we’ve been working together for about 5 years. He is definitely a believer in the ability of movement to heal pain and is hugely grateful for that pain relief. So ‘Five-Toe’ (what we call him for short) came in discouraged and out blurted a variation on the ‘death statement’. You’ve probably heard something along the lines of: “It doesn’t matter what I do; we are all going to die anyway”. Yes, but wouldn’t it be great if we could all live while we are still breathing? But let’s get back to good ol’ “Five-Toe”. I don’t put him through a series of therapeutic exercises twice weekly in order to keep people from sadly shaking their heads at his funeral: “Too bad he died so out-of-shape.” No, we work together so he can live while he is still breathing. So that when he does pass away no one will say: “What a relief; he suffered for so long.” No, they’ll remember him for doing just what he wanted and just what he loved every day that he lived.